The WordPress 5.0 update is a major release. Preparing for it goes well beyond simply turning off Gutenberg. See what you need to know to prepare and keep your site running smoothly through this transition period. Why Not Update to WordPress 5.0? This is a MAJOR overhaul of core WordPress code. Even if you plan to turn off Gutenberg, all other underlying code changes could cause issues on your site. Plus, it has been confirmed that we should expect minor releases every two weeks, at a minimum, after 5.0 releases. I believe the frequency will be way, way higher. And, I expect the bug fixes to have bugs. For these reasons, I strongly advise to NOT update to WordPress 5.0 for any production, money-making site that is working fine right now. If there are any security updates in the next few months, they will be backward compatible to WP 4.9.x. It may be early 2019 before I believe it will be safe to update to WP 5.x. Following are all of the site areas you need to check prior to the WP 5.0 release, even if you don’t plan to update it immediately. We’ll cover each one in detail in this post. Unfortunately, the timeline for the WP 5.0 release keeps changing, so there are no dates in this post. 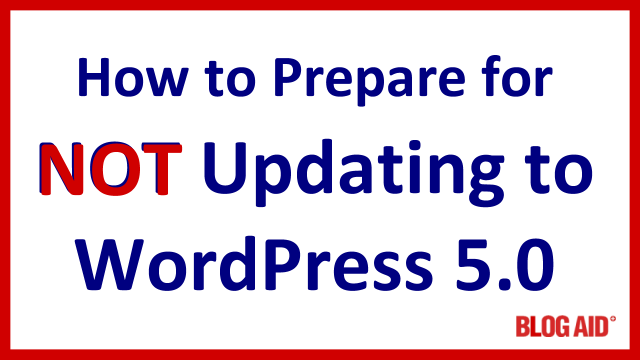 Bottom line, you want to do the following items at least a week prior to the public release of WP 5.0 to give yourself time to check everything on your site and ensure all is well before you make any other changes. And then sit still during the release period (about a week), so you don’t introduce problems. Be 100% sure you have a FULL backup solution that you know how to restore. If your backup solution offers a feature to get your WordPress core files too, that’s a nice bonus and will make restoring your site much faster. Do not count on your host’s backup. It is not guaranteed, even if you are paying for it. Read the fine print. Ensure your backup files are stored off your hosting. And ensure you know how to get to them. Check that storage to ensure your latest backup is actually there. Need a better backup solution? I use and recommend UpdraftPlus with storage at AS3 for small to medium sites, and VaultPress for larger sites. If using VaultPress, be sure your FTP and SSH restore connections are made. It will take forever to restore a site with the default option. READ: WordPress Backup Checklist to ensure you have all of your bases covered. Major releases, like going from WP 4.9.x to 5.0 will not auto update. But minor releases, like 5.0 to 5.1 will normally auto update. We don’t want any auto updates happening from now and probably through most of 2019 until the dust settles substantially on all of these huge core changes. READ: How to Use Easy Updates Manager to Turn off WordPress Core Updates for a simple fix to this issue and the caveats of taking full control over updates, as your site security is involved with this. The WordPress 5.0 update contains the new Gutenberg text editor. You need to take steps to specifically turn it off. For a while they talked about bundling the Classic Editor plugin with the WP 5.0 initial release. As of 12/4/18, that is not going to happen. There are both hard coded and plugin methods available for turning off Gutenberg. I’m favoring the Classic Editor plugin, made by Automattic, for most site owners. READ: Top 4 Ways to Turn Off Gutenberg for more details. WordPress 5.0 is only being tested with PHP 7.3. Unfortunately, 7.3 is not available at all hosts yet because it is still new and can be a bit unstable. And, we all have to move up to at least PHP 7.1 prior to the end of 2018. My advice is to check your current PHP version and try to move up to the highest level available now or wait until at least 2 weeks after WP 5.0 releases to do it. Just don’t change your PHP version during the WP 5.0 rollout period. If you do it, make sure it is at least a week prior to you can check everything on your site, including creating new content. If your plugins or theme fails, at least you’ll know what to look out for after that update rolls out. And, keep in mind that there will be a flurry of activity around this as the deadline of Dec 31 approaches. I suspect that if you find something broken in your test now that it may be fixed by that deadline. So sit tight if that’s the case for you. READ: How to Check or Change Your PHP Version for tutorials on SiteGround and A2 Hosting. Check with your theme developer to see if there are any special considerations for WordPress 5.0. Even if you don’t plan to update, you’ll know what to prep for. If you use Genesis update to the latest 2.7.x version now, prior to the WP 5.0 update rolling out. Be sure to check your site thoroughly afterward. READ: How to Delete Cache Everywhere to ensure you are seeing the latest changes. Take a full backup and update all of your plugins now, prior to the WP 5.0 rollout. READ: How to Restore Plugins to a Previous Version with WP Rollback so that you get into the habit of updating your plugins via this method now. Do not update any plugins the week that WP 5.0 rolls out unless it is an emergency security update. Some plugins will be furiously updating after WP 5.0 comes out, based on issues encountered with it. Those fixes could introduce new issues with your site if you don’t update to WP 5.0, as they may not be backwards compatible with WP 4.9.x. Hold off on installing any plugin to turn Gutenberg off. We are still waiting for confirmation that the Classic Editor plugin will be the one that ships with the 5.0 update. And, we are waiting for confirmation of any updates that might be added to it. If you have already installed one of these plugins, take it out. You don’t need it yet and we don’t have conclusive tests of what will happen in this scenario. After you’ve completed the above checks, relax. And follow me closely, as I will keep you updated with next steps, and when updates are safe to do. BlogAid News which includes breaking site news and all blog posts including the weekly Tips Tuesday post and podcast. This is a must-read for all DIY site owners. BlogAid on Facebook where I livestream news as it breaks. Site audit plus clients and webmasters – look for an uptick in emails and posts in our Facebook groups with deeper info. Delighted to help get us all through this as stress free as possible, Dee!